Running is one of my favorite things as of the moment. However, I hadn't always enjoyed running. In 2010, I made it a goal to live a fitter lifestyle and part of my gym routine is running in the threadmill. I first started walking and running in the threadmill for 30 minutes and progressed to running in 30 minutes. I was so proud of myself that I attempted to repeat that feat when running on a road near our condo but failed as it was to difficult for me, then. For a month, I googled how to run 30 minutes without stopping and I was able to finish the program in a month where I became bored towards its completion so I decided to abandon running and try other cardio activities as I found running really boring. Come 2011, I made a goal to try a 5k fun run race at least once. I tried to organize fun run with my swim buddies but our plans always don't follow through. But one day after a conversation with a gym buddy who is an avid runner. I decided to join my first 5k on May. I was so excited for this race that I trained for 2 weeks before and went to the venue early. I finished great at 35 to 36 minutes. After my first race, I came to a decision to do one race per month. I had found friends to attend fun runs and we all share the same passion for running. I scheduled the next run to be Slimmerun in mid-June but it rained hard so it was postponed to July. At that time, I had already joined 2 more fun run events by takbo,ph and Milo. So my July run became 3 fun runs. Slimmerun, my second 5k was such an experience since it was slightly raining but the efforts paid off since I got an impressive record there, which was 31:19. 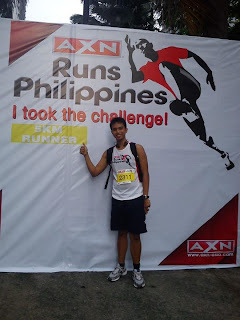 A few weeks later, I joined my third run in takbo.ph runfest where I run at the pace of newbie runners, Gee Ar and Dom. But had a great finish at 32 to 33 minutes. We skipped Milo marathon since it was raining hard and we were sleepy. And my last run AXN Runs Philippines, I got an okay finish at 31:55 despite the uphill of Julia Vargas. I still enjoy running until now and I find new running friends and set new running goals. As I mentioned, joining Fun Run events had became a staple in my budget. I allot money for registration fees in at least one race. If possible, I run at least 3 times a week. My usual routes are the road in front of our condo and Ayala Triangle. Recently, I came to a decision of aiming to run 5k at 25 minutes. I googled a program and have been following week 2 as strict as I can. The first week was painful as I experience pain all over my legs after the speed work routines even if I wasn't able to follow it. But I am still aiming to achieve that feat and I want to get a new PR in Adidas KOTR, which is our next run in October 23. I do hope I achieve that goal. I haven't made my mind about gunning for a marathon unlike one of my running buddies who is in his 5th week of a run-a-marathon program in 3-5 months. But after achieving a PR of less than 25 minutes. I shall be repeating that feat at least 2 more races before heading up to a 10k PR. Then, I'll figure it out when I achieve that. I love running too... started about 3 years ago, slow buildup from walking to jogging, till I could run 5k... unfortunately, I couldn't join fun runs coz they were usually on Sundays. Then my enthusiasm waned :( Now I'm back to walking again, and hopefully to running again... aiming to join a 5k this November! Anyway, may Saturday Fun Runs naman... Isama mo ang kids and other family members mo para family affair!! !